Saturn gas hotplates are the most cost-effective way for your foodservice establishment to save money and space. If your current gas range burners don’t provide enough cooking surface area, you can enhance your cooking power to service your patrons. These appliances also allow smaller restaurants, coffee shops and diners to efficiently add hot food to their menu. If you are in need of extra burners – for soups and sauces, for example – you can purchase these two-burner or four-burner models from MPM Food Equipment Group at an unbelievable price. 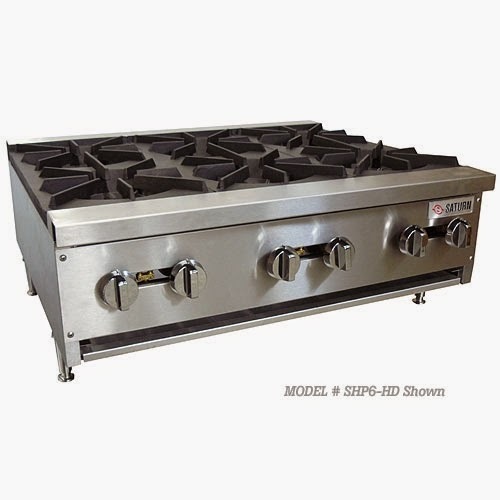 If you need two burners to extend your cooking ability, especially if space is tight, you can order the Saturn SHP2-HD Hotplate from MPM for only $503, a savings of $896 from the regular list price of $1,399. Do you need even more cooking power? 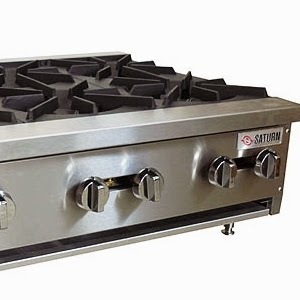 The Saturn SHP4-HD Hotplate has a list of $2,095, but you can buy it from MPM for $754, an incredible $1,341 savings. You won’t be able to find a better deal on top-of-the-line hotplates, and you won’t have to shoehorn a range in your kitchen. These efficient and practical hotplates will fulfill all serving needs for a perfect service, with independent controls that allow for precise yet separate temperature levels. Saturn’s durable units deliver excellent production capabilities and reliable construction into a manageable footprint that provides flexibility. Additionally, working with gas burners helps to promote even heat distribution and proper heat conduction. Many professional kitchens don’t have enough room to add another range or oven to the already cramped space. So if your space is limited and your range does not have enough cooking surface, a hot plate can provide extra capacity, serving as easier additions to your cooking lines. During the busiest times, most operations will benefit from having additional burners so they can complement your oven or range to satisfy demand. And because they take up little space, operators can install hotplates in back-of-the-house areas where additional prep work or finishing takes place. For smaller businesses that don’t need a full range, the Saturn SHP2-HD and SHP4-HD Hotplates are great ideas for space and money savings. They make a great investment for many establishments. You’ll find that working with such durable pieces of equipment like these Saturn hotplates can greatly improve cooking efficiency. The units are constructed from stainless steel, so you can be sure that they can withstand heavy use and the constant heat encountered in a busy kitchens. They feature virtually indestructible cast iron grates. The individual controls make it easy to choose just the right level of heat and to regulate temperature more efficiently. Since these hotplates have been designed to be relatively simple to maintain and to offer quick and easy cleaning, they can have a service life as long as 20 years or more. For more information on how the Saturn SHP2-HD and SHP4-HD Hotplates can improve the efficiency of your kitchen and improve your bottom line, contact MPM by clicking this MPM email link or calling (800) 976-6762 today. There are a few things that you should take into consideration before you purchase a gas burners online. Firstly, determine where and how you want to use this burner as this will enable you to decide upon the right size and design. Likewise, determine how much food you plan to cook using this burner.